We offer IKONOS fresh aquisition, as well as Archived Geo Product to TerraFly users. Geo is a geometrically referenced product that has been corrected to a datum and map projection. The correction process removes image distortions introduced by the collection geometry and re-samples the imagery to a uniform ground sample distance and a specified map projection. Geo may be ordered in a variety of projections and formats. Orders may be filled with multiple source images which may be mosaicked and reformatted as an option. Tonal variation between scenes may be visible. Request more information on IKONOS Geo Product at . 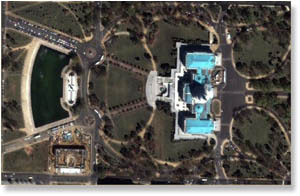 TerraFly offers a service of custom aquisition of IKONOS satellite imagery. Please drop us a note to be contacted with various options to have IKONOS imagery collected over your area of interest at .